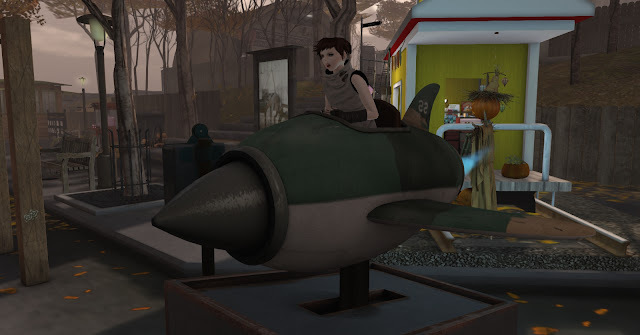 Sitting in my unsorted screenshots folder is a small collection of random pictures I have snapped for various reasons that, by themselves, don't have enough weight to have their own blog post. I like to let them mount up in the corner, then post them all together in a swirl of dust. So here goes. 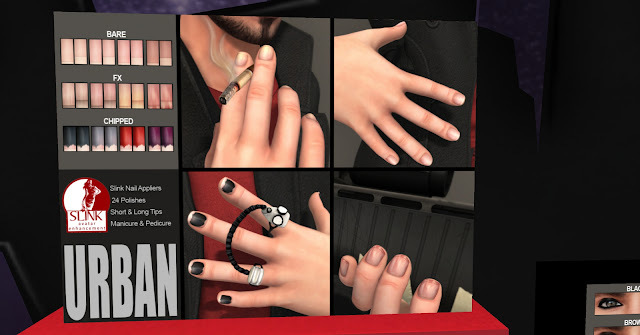 I am as big a fan as anybody of the SLink add-on hands, and the grid seems now to be awash with people making virtual nail varnish. At the Cosmetic Fair, I found this advert for chipped nail varnish. I'm not exactly a fashionista, but I'm aware that chipped nail varnish is 'a thing', if you like, in the real world, and so I suppose it wasn't going to take too long to make an appearance in the virtual world. I didn't buy the chipped nail effect, so I can't tell you first hand (lol) how good it is, but it looks pretty cool from the pictures. Nail varnish is something I own quite a lot of in real life, and this love hasn't been lost between realms. It's also worth mentioning that these varnishes, and the other make-up on sell by this vendor at the Cosmetic Fair, was all modelled by men. I didn't notice anything else at the Cosmetic Fair using male models, and I thought it was pretty cool. At no point did I think 'this must only be aimed at men, then', and I started wondering whether the appearance of more male models would open up the forum, and allow men to look at female models and still consider the product for themselves as I did. Unfortunately, I'm an idiot and I didn't note down the name of the shop selling these. If you have it, pop it in the comments? Thank you. Another fair: I snapped the above picture at the Enchantment Fair. The Enchantment Fair is offering fairytale themed items, and the first three months' are about Snow White. The first stand I came across when arriving at the fair was this one, selling necklaces featuring this wonderfully made poisoned apple, amongst other things. I just thought it was all kinds of wonderful. It was made by aisling, and I really, really want to buy it. 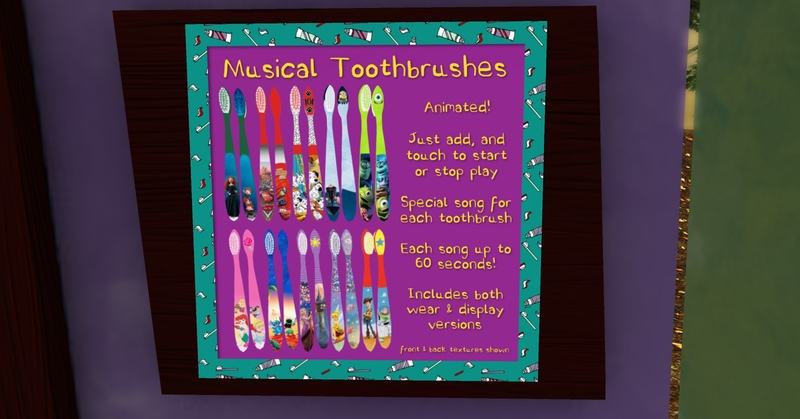 Yup, that's right - I found toothbrushes. Toothbrushes that sing to you. I have no idea where I was when I found these, except that it was at yet another fair that was selling a lot of things aimed at children. I'm not sure how legal these are, since they use what look like straight-lifted Disney pictures and no, I didn't buy one, but they did make me laugh. Dental hygiene is clearly very important to beings whose teeth are fake and who cannot eat, drink, or get gum disease or bad breath. I'm filing this one with the toilets and the washing machines that originally informed my original essay and the opinion that our avatars are nostalgic for a world we want to escape (which is an intellectual Chinese finger-trap). I found a wonderful picture of this little space rocket on Flickr (which I am struggling to find again - sorry!) and, realising that I'm becoming a little bit of a hermit, decided I would go and explore the sim it was in. Norah Vespers came with me, which always makes any trip twice as fun. We found the pictured rocket and, of course, Norah hopped in it. Dressed as modern space-girls as we were, we made the rocket seem dated, retro, rustic, and I like the idea that we became a portrait of nostalgia on several layers. 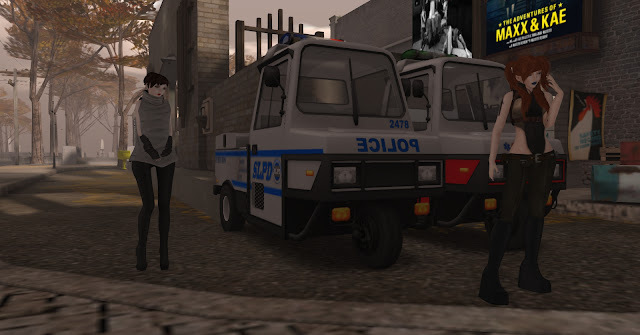 Police golf cart milk float Robin Reliant things. Yup, wouldn't you be just petrified if one of those was coming after you? With our fit space-girl bodies, we could almost definitely out-run those things were we to get into trouble - which, of course, we never ever do. And finally, a werewolf tried to scratch me. No, really, it happened! Except that, because of the way SL almost pedantically upholds social maxims (namely, thou shalt not do anything to anybody else unless they give you expressed permission), he had to ask me if he could cut me up with his claws first, and I of course said no. I have no idea where this guy saw me to even attempt to attack me, but attack me he did. I was in the comfort of my own skybox when I saw the notification, and that seemed to make the offer simultaneously more funny and more scary. I've written a little bit about Bloodlines here, which I shall lazily paste a link to rather than explain again - here. Personally, I think he might have been more successful had he forced the action on me using the /me function, but I'm also kind of glad he didn't do that, for obvious reasons. Polite werewolves are definitely a thing now, especially since Anne Rice is writing their life stories. Being English, and a lover of Anne Rice, I appreciate politeness ;). Yes, Kitti is wearing cat ears in that last picture, but is that really the oddest thing in this post? !